On Saturday, March 24, PKS reached a notable milestone as our first group of students set off for the first class trip to China. Parents, siblings, and grandparents were on hand to wish the voyagers farewell. This marked the launch of our ambitious program, PKS东南西北. Our students headed to the Yellow Mountains to explore the history, art, and culture of this beautiful region. Following are the teachers' daily trip journal entries sent to families. For more photos, head over to our Facebook page. We are nearly done with our first full day in China, and it has been a lot of fun! We began early, around 6:30am, as a group of students ventured out for some 油条 and 豆浆. Those who slept in a bit had oatmeal and fried eggs in the hotel restaurant. We then took a walk to the center of this 1,000-year-old town and did some general orientation. We discussed the differences between a "tourist" and a "traveller," talked about what we had already observed about our new surroundings, had a discussion of proper etiquette in southern China, and took a nice walk along the river. We then had a huge lunch which was a great success except for the "furry tofu" which many students tried, but none enjoyed. After lunch, we had a scavenger hunt, ate some ice cream, and took a short rest. We taught the students some traditional games during our rest (a favorite is called "Kill the Landlord"). Eli noticed the character 拆 written on dozens of buildings. He asked what it meant. This led to a long discussion of how quickly China continues to modernize (the character means "tear down" and is written on buildings the local government has designated for demolition and reconstruction). Simon asked a gentleman in a tea shop what tea the region is most famous for. "毛峰茶" was the reply. Simon asked what it tasted like and why it is so famous. "Your Chinese is fantastic!" was the reply. The kids are feeling jet-lagged now, and ready to relax and lounge after a day of a lot of walking. We are now preparing for dinner, a movie, and an early bed. Tomorrow, we are off to the tea fields! We feel very lucky to be here with your children. They are making us proud. Though this was only our second full day in China, it was already a day where we felt we had established some routines. The early risers went with Mike to buy breakfast on the street near the hostel. Others got a bit of extra rest before our "real" breakfast of oatmeal, eggs, manto bread, and baozi. We then had journaling time: we asked students to focus on the concept of being good guests, and shared our thoughts on what this meant at home, and here in China. After breakfast we began our first "project" day. We studied Mao Feng tea (毛峰茶), one of the most famous green teas in China, grown exclusively in the Yellow Mountains. We rode high into the hills into a village that focuses exclusively on tea cultivation. All of the teachers were impressed with the curiosity of the students. Nate, for example, asked our hosts, "how old are these tea trees?" (More than 100 years old.) Christian asked how much a basket full of freshly picked tea leaves would be worth. (Depends on the quality.) Elvie asked how long it would take a professional tea picker to pick as much as the 13 of us picked in an hour. (To this, we simply got a knowing smile.) All of these interactions were, of course, exclusively in Chinese. Experiences like these have made the teachers proud and, as the students see how far their Chinese can take them beyond the PKS campus, filled them with confidence. After a morning of picking tea, we had lunch in the village, then learned how to "cook" the tea into its final form. We also had a small taste test, giving students a sip of a variety of teas. It turns out Soren has the most sensitive pallet, and was able to identify the finest tea with only a small sip. After returning to the hostel, students had some more time for journaling, some down time, and we then had a long dinner during which we played games and told riddles. When your kids get home, ask them to show you how to draw the moon, and how to use chopsticks to count in ancient Chinese. A couple of students were exhausted by this time, so we offered an early bed time. Other students joined for our evening circle. We did our daily health check in, "roses and thorns," and ended with a discussion of how to pay attention to how our actions impact others. Your kids are working so hard to be gracious, culturally sensitive, thoughtful guests. They don't always succeed, but we are grateful for their kindness, their willingness to grow... and to have them in a place where there are plentiful opportunities to think beyond themselves. Tomorrow, we have another day of adventure, this time learning about Black Tea (红茶). Time is flying! Less than a week to go before we return. The teachers are wrapping up Day Three by sitting together and making peanut butter and jelly sandwiches. We will bring them for lunch at the mid-point of tomorrow's hike in the Yellow Mountains. This hike should be the highlight of our trip. The Yellow Mountains are so named for the Yellow Emperor, the mythical ancestor of the Chinese people who lived in the mountains and there became a supernatural being. The mountains provide some of the most breathtaking and singular scenery on earth. The kiddos, meanwhile, are all in bed after a long, full day. We woke up this morning feeling fully settled here in our ancient town. The students now know the best stall to buy a breakfast 油条, and from whom to buy fresh soy milk. They know the nooks and crannies of the compound that houses our hostel and are comfortable wandering its peaceful, quiet grounds. And they are, for the most part, over their jet lag. We jumped on the bus after breakfast and headed towards the tea fields. On the bus, we discussed Chinese history. The students are eager for stories of modern China and its rise to power. They learned Deng Xiao Ping's famous phrase 黑猫白猫，能捉到老鼠就是好猫. "It doesn't matter if it's a black cat or a white cat, as long as it catches the mouse." During our discussion, Rohan showed off an impressive knowledge of WWII history and Miles came up with a detailed plan to create a world-wide utopia. Yesterday, we studied green tea. Today, we studied black tea, or - as it is known in Chinese, 红茶 ("red tea"). The first mystery of the day was for the students to figure out why it is "black" in English and "red" in Chinese. After a day of study, Eli figured out the answer. Ask him next time you see him on campus. Students learned the chemistry of the process of making black tea, a far more complicated process than making green tea. They also picked tea of their own and went to a whole-sellers market to try to sell what they had picked. Their competitive energy made them all fierce bargainers, and they were actually able to sell their collective tea for nearly twice what our local guide expected. Liv and Anthea paired up and took the prize for driving the hardest bargain-- together, they earned 20RMB. The activity in the tea market led to a fantastic discussion at our closing circle after dinner. "How did you feel when we first entered the tea market?" asked Ma Laoshi. Students used words like excited, scared, determined, and overwhelmed. It took courage to enter the busy market full of professional tea buyers. Students noticed how their race and their gender seemed to influence how people reacted to them. They also made note of how disappointing it felt to work for an hour in the field and earn less than one US dollar. But they were also proud of the final results of their work... and they used their hard earned money to buy oreo cookies and lollypops. The theme of our discussion was empathy. Liu Laoshi asked students how the tea buyers must have felt seeing a group of foreign students come to sell tea. Mike asked them to think about the life of a tea picker. He also shared a story from Thich Naht Hahn on the mindfulness one can have when doing something like drinking tea (or, in the case of this story, eating an orange). This mindfulness can only be reached when you fully understand the story of what you are eating or drinking. Thank you for sharing your children with us! It has been a wonderful beginning to our trip! What does it take to get from 250 10th Street to the top of Huang Shan? A car ride to SFO. A 13-hour flight to Shanghai. A four-hour train to Huangshan City. A 90-minute bus ride to the base of the mountain. A 20-minute cable car ride to the trail head. A two-hour hike. Today, the mid-point of our trip, was a long day of hiking in the beautiful Yellow Mountains. The students were happy, ready for the challenge, and playful with each other and with those we met along the way. Twice, we offered an option: you can take a challenging scenic detour (adding 40 minutes or so of hiking) or the short, easy, but less interesting path. Both times, every student took challenge. The first challenge was to hike to an area called "Stone Monkey Gazing Over the Sea of Clouds." The view is of a tall rock that looks remarkably like a monkey with his head leaning on his hands. The second challenge was to the "Dawn Light Pavilion." It was at the Dawn Light Pavilion that we stopped for lunch, had some time for journaling, and rested our legs. We were so proud of this group for saying "yes" to the challenges... and there were more than just physical challenges. They were also consistently engaging with those we met on the mountain paths, many of whom were quite curious about our group. 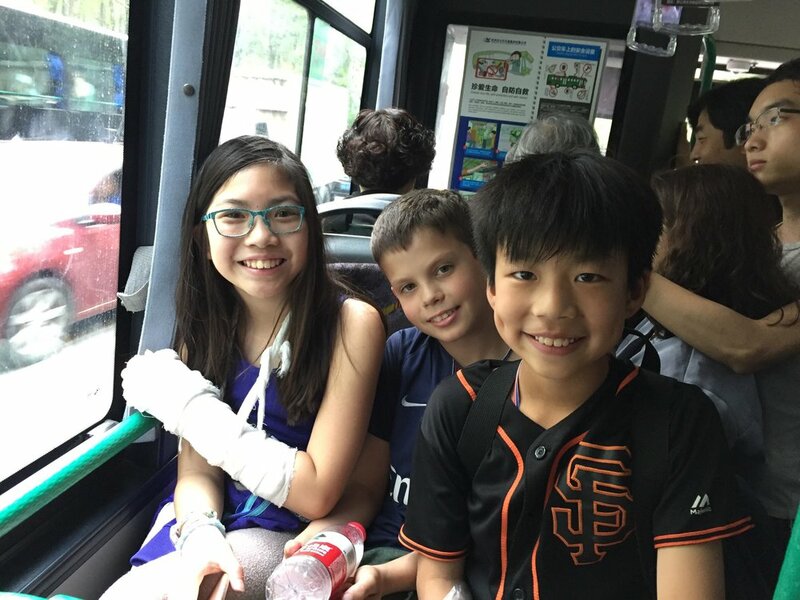 These casual, real life interactions gave us opportunities to teach them about regional accents, the slang and colloquialisms often used in China (and not necessarily in a classroom), and how language ability is only half of what one needs to communicate clearly (the other half is cultural awareness). It was a long day, so we are going to keep our journal entry short... more to come tomorrow! What are the two most popular drinks in the world? [Answer: #1 is water, #2 is tea] . At the end of the day, students completed a tasting journal that noted each tea's origin, the appearance of the tea leaves before and after steeping, the chemical process involved in making the tea, and adjectives to describe the taste. Some winning descriptions of the smells included descriptions from Elvie and Simon: "fresh peas" "sour grass" and "licorice." A winning description of the taste came from Nate and Miles: "cat litter." Students also heard the story of the Qianlong Emperor who was such a tea fanatic that he had workers bring him water from across China to figure out which was the best for tea. In the end, he decided that the dew from the lotus flower was the best source of water in the summer, and that melted snow was the best choice in the winter. What a snob! Along with our tea focus, we also took time to learn more about Chinese food. A local chef took us to a vegetable and meat market in town, gave the students a tutorial on how much things should cost and how to tell the quality of different foods, and then set them off to bargain and purchase. The meat portion of the market was harrowing for a number of students as they thought about the origin of meat: living animals. This led to a rich discussion at our evening circle. During "roses and thorns" many students named the meat market as their thorn. Anthea reflected back on our discussion of mindfulness: "if we drink tea with mindfulness and think all the way back to the tea picker, and the rain that watered the tea, then eating meat mindfully is really scary." Eli asked questions about humanely raised animals, and asked if animals could be killed in a humane way. Liv redoubled her commitment to vegetarianism. The students handled these discussions with maturity and nuance.... But be prepared for some questions next time you head to In & Out. After we shopped, we cooked with the chef. Students made sweet and sour pork, red sauce chicken wings, fried bean seeds and tofu, stir fried bok choi, steamed shrimp, and bamboo shoots with pork. Today was our final day in Huangshan. We began with breakfast at a restaurant near our hostel. At this point in the trip, the students are confident enough to do the organizing of breakfast by themselves. One student will take orders for 油条 and head off to buy them. Another will do the same for 豆浆, a third for 茶鸡蛋, a forth for 酸奶, etc. Before we know it, a feast is set before us. After breakfast, we took a long walk down the river to Yuliang, a port town originally built during the Song dynasty. At that time, it was a place made rich by the salt trade. We discussed the reasons salt was such a key commodity in the pre-industrial era (it was a preservative), and connected this reason to our study of tea (bacteria!). Here we are on a staircase that leads from the town above down to a 1,200-year-old dam. After our walk, we prepared for our closing ceremony. Each student was asked to look back through their journals (most of which are 30 or more pages long at this point) and reflect on five key questions. After this preparation time, we gathered in the library of the hostel and each student read from their journal. Some of the common themes in the student reflections included noting the difference between a tourist and a traveller, working to pick up on unspoken cultural clues so one can be a good guest, and on working hard to avoid turning something complicated (China) into a simple summary, definition, or idea. When your kids get home, ask them if you can look at their closing entries in their journals. Their maturity and the details they included will surely make you proud. After the ceremony, we went for ice cream and then souvenir shopping! The day ended with students trying to stuff their souvenirs into their already full luggage. Tomorrow morning, we board the bus and head for Hangzhou. It will be sad to say goodbye to Huangshan, but we've experienced a lot, grown closer as a group (yes - it is possible for this group to get even more tightly bound! ), overcome adversities, and each of the students on this trip has grown in maturity and confidence. They are growing up fast. We boarded the bus early today and headed to beautiful Hangzhou. Upon arrival, we went to eat Lanzhou Lamian, the most famous dish from Liu Laoshi’s hometown (and Mike’s favorite Chinese food by a mile). The meal was a big hit and gave everyone the energy they needed for an afternoon scavenger hunt that threw students into China’s digital ecosystem. Students were divided into 3 teams, and each team had a “silent” chaperone. “A teacher will be with your team to keep you safe,” we told the students, “but their job is not to help you with this task; they will follow your group and intervene only when absolutely necessary. You will have the tools you need to complete your work.” The task was to find and photograph a series of sights along the West Lake. Each group had a different set of sights. And off they went! One group quickly used Baidu maps to plot the proper bus routes to their sights. A second group started with the paper map and decided to ask for directions along their route. A third group combines the methods. In the end, each group was able to make their way to the West Lake. To do so they needed their language skills, teamwork, the patience of a true traveller, and a sense of how people in China use the digital world to help in daily life. Only one group completely succeeded in this difficult task, but all groups learned the power of Baidu maps, the importance of having WeChat and AliPay in China, and the ways phones are quickly eliminating the need for paper money here. After the scavenger hunt, we had dinner and painted Easter eggs. Students are now in bed... with only one more full day to go in their journey! It was a wonderful, if bittersweet, final day in China. We began our morning with a long hike from our hostel up to 龙井村, home of world famous Dragon Well tea. Our students have really become tea experts, aware of subtle differences in taste, the vast differences in methods of preparation, and the global importance of this ancient commodity. On the hike to the village, we stopped at the World Tea Museum and learned of how tea spread from China across the world. We also learned some surprising facts. Do you know which country drinks the most tea, per capita? Ask a 5th grader! Do you know when tea was first imported in Britain? Ask a 5th grader! After the tea museum, we went into downtown Hangzhou to a crafts museum. Students each learned how to make 油纸伞 (bamboo umbrellas). A 7th generation umbrella maker was our teacher and he walked the students through the delicate process of making their own umbrellas. The process took a better part of four hours, but student determination and focus never wavered. They took the craft (its culture; its history; its art) very seriously. After making their umbrellas, we walked along the Hangzhou section of the Grand Canal (first built during Sui dynasty to connect Beijing and Hangzhou). We walked over A 900-year-old bridge that marks the end of this ancient marvel. We ended the evening with the food our students have learned to love the most: 兰州拉面. At our closing circle, students shared their final reflections, thanked their teachers, and spoke of lessons they will take home with them. The students are sad to be leaving, but-- of course-- very happy to be heading home to their families (and to pizza). One student's words summarize the trip quite nicely: "I've been waiting for this trip for years, but I never imagined how amazing it would be. We are all very lucky to have the chance to be here." The students thanked their teachers with hugs, shed a few tears, and headed off to do some final packing. In a few moments, we will tell them it is time for lights out. Tomorrow morning, we head for the airport at 6am.